JUVÉDERM® fillers are made using hyaluronic acid, which is a natural substance in the skin that; delivers nutrients, helps the skin retain moisture and softness, and adds volume. Each product in the Juvederm collection of hyaluronic acid fillers adds volume to a different area of the face. The results are long-lasting and subtle. Voluma: Voluma is an injectable gel that instantly adds volume to the cheek area to correct age-related volume loss in adults over 21. Over time, the cheeks flatten, causing the skin to sag. Voluma is the only filler proven to last up to 2 years in the cheek area. Vollure: Vollure is indicated to soften and plump moderate to severe facial lines and wrinkles in the lower face. Vollure helps smooth and soften the lines and folds, to provide a subtle and long lasting result for up to 18 months. 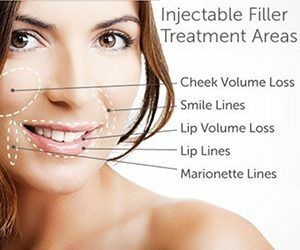 Volbella: Volbella is the first and only FDA approved filler proven to increase lip fullness and soften the appearance of vertical lip lines for up to 1 year. These perioral lines are often caused by repeated muscle movement and sun exposure.